Traffic Deaths up 9% in 2016 - The Augustine Insurance Group Inc. Preliminary estimates from the National Safety Council indicate motor vehicle deaths were 9 percent higher through the first six months of 2016 than in 2015, and 18 percent higher than two years ago at the six month mark. An estimated 19,100 people have been killed on U.S. roads since January and 2.2 million were seriously injured. The total estimated cost of these deaths and injuries is $205 billion. If you think insurance can be complicated, imagine what your clients must think. That's why we make our products easy to understand and even easier to sell. The upward trend began in late 2014 and shows no signs of decreasing, according to officials. Last winter, the National Safety Council issued its largest year-over-year percentage increase in 50 years, when it estimated fatalities had jumped 8 percent in 2015 compared to 2014. 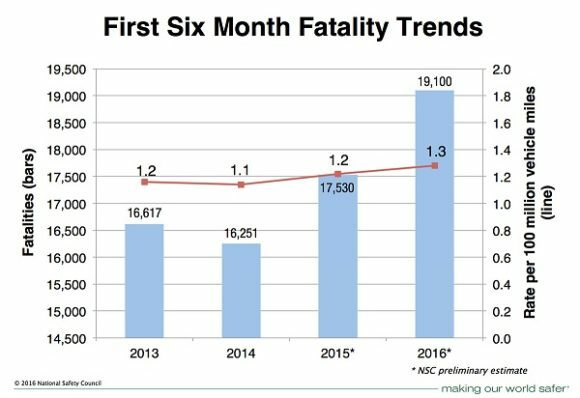 The continued rise in fatalities is prompting the safety group to issue its highest fatality estimate for the Labor Day holiday period since 2008. NSC estimates 438 people will be killed during the three-day holiday weekend. States that have been particularly hard hit since 2014, the start of the upward trend, are Florida (43% increase), Georgia (34%), Indiana (33%), California (31%), North Carolina (26%), Illinois (24%) and Kentucky (24%). Motor Vehicle Fatality Estimates – 6 month trends. National Safety Council. While many factors likely contributed to the fatality increase, a stronger economy and lower unemployment rates are at the core of the trend, according to the group. Average gas prices for the first six months of this year were 16 percent lower than 2015 levels, helping to fuel a 3.3 percent increase in the number of miles driven.